When I made a smoked salmon, artichoke and red onion pizza the other day, it was inevitable that there’ll be some ingredients left over and in need of demolishing. I categorically hate to waste food, and whenever I have a recipe in mind always think in the back of my mind “What else could I make with…”. Whilst smoked salmon certainly falls in to the ‘luxury ingredient’ category, it is widely available, regularly on offer and, for recipes can be used sparingly. Confession time: I am a sucker for special offers in a supermarket. Those marketers know how to woo me into buying things I don’t need, and a shelf end promotion is an ideal location to scream out ‘buy me now!’. I often do a shop on the way home after work and may be tired and hungry – a fatal combination – resulting in me deviating from my list of what I need into a whole load of stuff I had not anticipating buying. Aside from admitting that I have near to zero willpower where resisting offers are concerned – I do often end up having to find something to make. My guilty purchase was none other than a pack of wheat Tortilla wraps which got me thinking…. First, I thought, what a lazy sod am I not trying to make the wraps myself! I will try and get there one day. Second, I thought of a new brunch idea which would be quick, simple, and be something I would gladly make again. I also wanted something a little lighter than toast which, even if from home-made bread is a little heavier than what I wanted this morning. Please note: I am making no claim that wheat tortilla wraps for breakfast or brunch are my idea – if you search online for them, the many iterations are ubiquitous. Even fast-food chains offer them and have done so for a while. 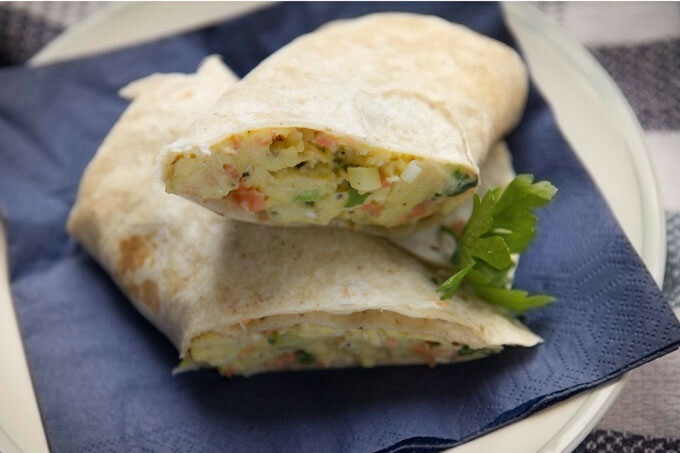 What I had not seen was scrambled egg and smoked salmon tortilla wrap recipe, with only spring onions, fresh parsley, and capers added for texture, flavour, and colour. Break the eggs in a small bowl and roughly beat with a mini-whisk or fork. Season with black pepper. Then, trim and thinly slice the spring onions, capers, and parsley. Next, thinly slice the smoked salmon intro strips. Heat up a pan to a medium heat, then warm up the olive oil. Once the oil has started to gently bubble, add the butter. Once melted, stir in the spring onions and capers, and soften for 1-2 minutes. Then, mix in the smoked salmon slices, cook for a further minute, reduce the heat slightly, and pour in the beaten eggs and chopped parsley. Combine all ingredients evenly with a spoon, then leave to firm up. After a minute, stir thoroughly and continue until a firm texture forms throughout. Once cooked, allow the scrambled egg to cool slightly. Then, spoon half the mixture vertically along the centre of the tortilla wrap (it'll become cylindrical in shape), and ensure that you leave 3-4cm free at both the top and bottom of the wrap. Then, fold over the top, then bottom on the wrap towards the centre so that the top and bottom are flat. Next, tightly fold the left of the tortilla over the centre of the filling and continue to tightly roll until until the the wrap is a complete cylindrical shape. Finally, cut the wrap in half from the middle at a slight angle. Due to inherent saltiness of smoked salmon, there is no need to add additional salt to the recipe. Feel free to experiment- try and substitute red onion for spring onion, use a little grated lemon zest in the mix, or try dill instead of parsley.